Making a trailer with sound — Welcome to the GameSalad forum! Hi.. I'm at the state where I'm looking into making a trailer for my game. I'm thinking of using Quicktime, then editing in iMovie. The only thing is that apparently Quicktime doesn't record sound. Does anyone know of a way to do so? I've found this thing called SoundFlower – is this ok? I read some mixed and quite negative reviews. Screenflick is awesome for capturing game video/audio. I've found this thing called SoundFlower – is this ok? I like ScreenFlow, but that is not free software. Quicktime does record sound. 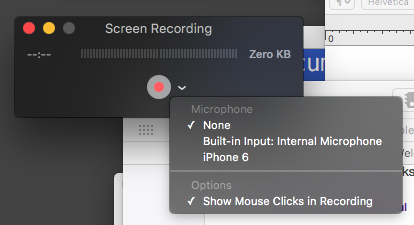 If you are recording screenshots from your device you can select whether to pull the sound from the device or from your mac. Its just that the default is for "none." Thanks for the suggestions. @Agent Argyle I tried the Built-in Input option but it just records ambient sound from the room I'm in. I was hoping for it to record the true sound coming only from the game without any background interference. It's weird that quicktime appears to not be capable of this. It makes me think that Apple are trying to prevent pirating or something like that. Thanks for the suggestions. @Agent Argyle I tried the Built-in Input option but it just records ambient sound from the room I'm in. You have Quicktime's audio input set to 'internal mic'. I was hoping for it to record the true sound coming only from the game without any background interference. @monkeyboy simian You need to make sure your phone is not on vibrate and that the volume is turned up. I used quicktime to get sound off my phone for multiple videos. Then just follow that screenshot above and it should work fine. @monkeyboy simian Also, choose the device name, not built-in. Built-in means the audio input on your computer itself. He's not actually said whether he's recording from a device (like an iPad) or the computer itself, so a lot of this advice is guesswork. His mention of Soundflower suggests he's recording from his computer and not a device, but like I say without him actually telling us what he's doing it's all just guesswork. Just recording the GS simulator from the mac. I've got Soundflower now – it was installed by ScreenFlick. Works well enough. I'm currently piecing it together in iMovie.
. . . it's way better to record your devices screen . . .
2) Elgato HD60 - Max 44 Mbps to 8 bit H.264. 4) Reflector 2 - around 16 Mbps to 8 bit H.264. 5) Quicktime / various screen capture software - around 10 Mbps.